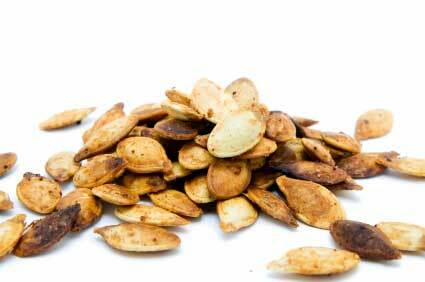 ROASTING PUMPKIN SEEDS is easy to do. Makes a great low carb snack! The only hard part of this recipe for roasting pumpkin seeds is cleaning out the pumpkin to get at the seeds. But it's well worth the effort and the whole family can pitch in!!!! First cut a large hole at the top of a medium size pumpkin. Using a large serving spoon, scoop out the seeds. They'll be slimy and covered in fibers. Remove as much of the stringy stuff as possible. Rinse well. Place the seeds in a saucepan. Add water to cover seeds plus another couple inches. Bring to a boil and then lower the heat to simmer for about 10 minutes. Drain. Let the seeds dry spread out on a clean tea towel overnight. Then choose one of the recipe variations that appeals to you. Save the pumpkin meat for making a great soup! Melt the butter over low heat. Add the seeds and coat thoroughly with the butter. Place the seeds on a parchment paper-lined cookie sheet. Sprinkle evenly with the salt. Bake them on the middle rack for 30 to 45 minutes. They should be golden brown. Melt the butter over low heat. Add hot sauce. Add the seeds and coat thoroughly with the mixture. Bake them on the middle rack for 30 to 45 minutes. Melt the butter over low heat. Add rosemary, cayenne and sugar substitute. Add the seeds and coat thoroughly with the mixture. Let’s go from the roasting pumpkin seeds page to the HOME page.